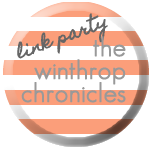 Welcome to this week's link party! Don't forget to check out this week's giveaway two yards of fabric from Fabricworm. And make sure to stick around for leggings week this week, where all the posts are dedicated to leggings.